Well, the other day dawned overcast and in the 60’s. It’s been mostly high 70’s & 80’s still in this part of the country, so the urge to bake was too strong to resist. And since I still haven’t baked anything pumpkin, this afternoon I decided to come up with a recipe for pumpkin pound cake. Now I know there are probably thousands of pumpkin recipes on the internet, but I like to play in the kitchen. It’s what I do. So that’s what I did. And I have to say that this is going to be a hit with my friends and family! Frosted it with cream cheese flavored with cloves, cinnamon, and vanilla and sweetened with local raw honey. And just in case that wasn’t enough, I chopped up some pecans and sprinkled them across the top. Oh! My! The house smelled heavenly while it was baking and I couldn’t resist, I just had to have a piece still warm from the oven. I was so excited to be playing in the kitchen again that I totally forgot to take any pictures! I was bummed. But I didn’t want you all to have to wait for the recipe until I had another day off so I could play some more. So here’s the recipe, sans pictures. As always, I try to use the freshest, least processed stuff I can find, and that’s how my recipes are written. That said I actually used white flour in this recipe. It is, after all, a treat that I won’t be making all the time. If you don’t have organic stuff, just use what you have and don’t feel guilty about it (like I used to). Homemade always tastes better and is better for you than store bought! So here we go. Cream butter and sweetener; add eggs one at a time, beating after each one. Beat on high 2 ½ minutes. Add vanilla, cinnamon, nutmeg, ginger, and cloves and mix. Add pumpkin and beat oh high for 2 minutes. While that is beating, sift dry ingredients. Add the dry ingredients a little at a time until incorporated. Add the buttermilk and mix. When that has been mixed in, beat on high 3 ½ minutes. Butter and flour a Bundt pan. Spoon the batter into the prepared pan (batter will be quite thick). Smooth the top and bake at 325 degrees F for 1 hour and 10 minutes. While cake is baking, prepare frosting. It will need to be chilled. After an hour and 10 minutes, test with a toothpick. If the pick comes out clean, remove the cake from the oven and turn it out onto a cooling rack. Let the cake cool before frosting. It doesn’t have to be cold, just not still warm enough to melt the icing. Pour yourself a nice hot cup of whatever you like and take a minute to relax and enjoy the fruit of your labors! 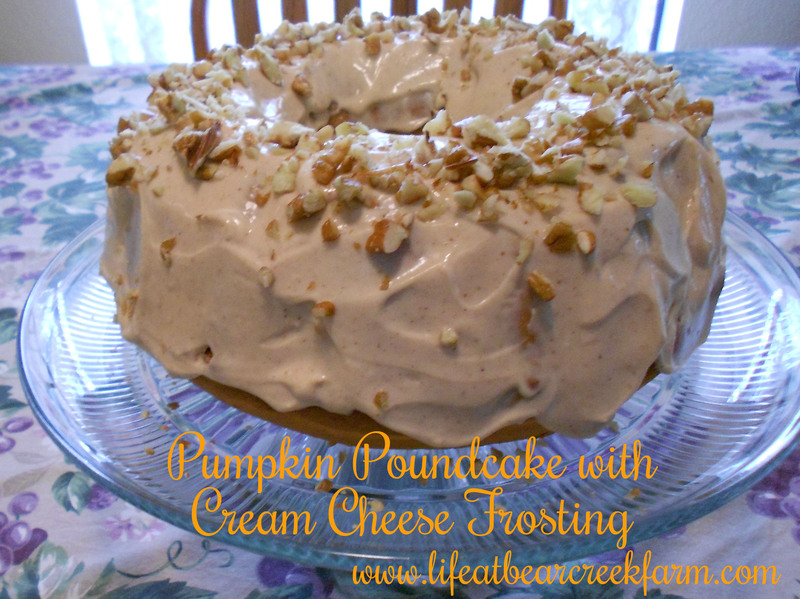 This entry was posted in Deserts, Mother's Kitchen and tagged baking, cream cheese icing, fall, homemade vanilla extract, poundcake, pumpkin by Cery. Bookmark the permalink. This sounds scrumptious! I’m new to all of this, I’ve only ever had pumpkin in pie and pumpkin bread, but this year my eyes have been opened to the possibilities! Thank you for sharing this at the HomeAcre Harvest Hop; I hope you’ll join us again this Thursday. 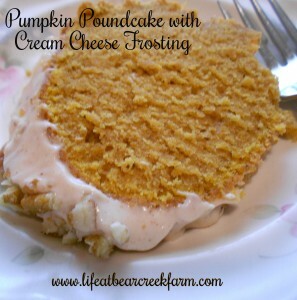 Kathi, it’s amazing all the things you can do with pumpkin! 🙂 I will absolutely join in again, thanks! Pingback: The HomeAcre Harvest Hop! I’m drooling here 😉 I featured your post today on The HomeAcre Harvest Hop! Stop by and grab our super cute button to show off your feature! Pinning this to our Harvest Hop board too! Wow, thanks Lisa! I will definitely grab the button. Thanks for hosting!